The marina is now closed for the season. Newport City Dock will re-open on May 10, 2019. The City Dock is an important hub connecting visitors to our city's Main Street and Downtown area. 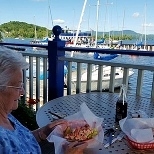 Boaters from northern Vermont and Canada can find a number of amenities including restrooms, access to the bike path, a public launch and courtesy dock, benches, picnic shelter and other conveniences like retail gasoline, ice and lake maps. Services include boat washing station, pump-out station and zebra mussel registration. The harbor is also home to the Us Customs Boarder Patrol Checkpoint, Newport Natural Chowder Shack and the nearly 100 year old Memphremagog Yacht Club. The City of Newport manages numerous seasonal and transient dock slips and three mooring fields at the City Dock. With full hook-ups and sites large enough to house boats up to 36', the Newport City Dock is a popular seasonal destination for many water travelers. Slips include access to wifi, private bathrooms and showers and optional power/water. With three mooring fields, a large lake pier and finger docks, the City can house up to 80 boats with many slip holders living on their vessels throughout the season. For non-motorized boats, the dock offers canoe and kayak storage, free parking and an accessible boat launch. The City Dock is open late May through Columbus Day, with dock staff available from 9:00AM-5:00PM daily, weather permitting. A picturesque banquet hall nestled on the shore of Lake Memphremagog with breathtaking views of Owl's head and the Canadian mainland. The building features a north side of glass doors that open to the lake allowing guests access to wrap around balconies. 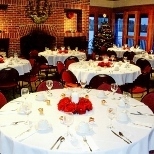 The Gateway Center is perfect for weddings, concerts, business meetings and private parties. The two-floor building holds 100 people comfortably and is available for rent year round. For more information and rental rates, visit Newport Natural or call (802)334-2626. Open seasonally, the Chowder Shack is a new lakeside dining option right off the dock. Established in 2016, the menu features a variety of sandwiches, fresh chowders and salads to pack on your bike ride or eat right there on the patio. Operated by Newport Natural Foods, the local, farm-to-table restaurant has carried their reputation for wholesome food and attentive staff down to the waterfront. Whether you're looking for a healthy alternative or a summertime staple, this little eatery has something for everyone! The Harbormaster can be reached periodically during the off season ​by emailing CityDock@NewportRecreation.org or calling the Parks & Recreation main office at (802)334-6345.